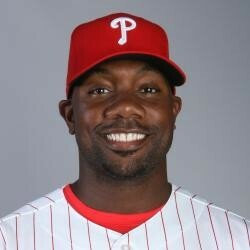 Ryan Howard has had a difficult 2016 season, but had a good game in what is likely his second to last game as a Phillie. He went 2-for-4 with a home run and two RBI. Howard now has 25 home runs for the season. Howard is batting just .199 this season, but still has put together excellent power numbers. He'll likely be playing in the American League next season as a designated hitter. Howard can still be a 30 home run year player if he gets enough playing time.